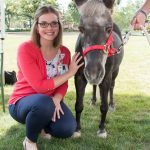 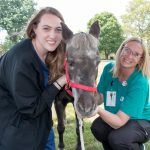 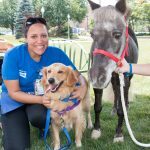 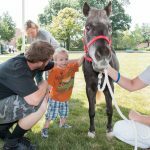 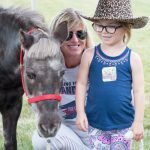 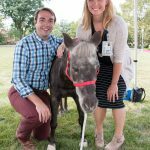 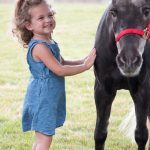 Petie the Pony returned to Akron Children’s Hospital to celebrate 20 years of delighting our patients, families and staff. 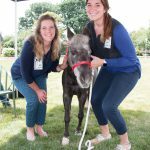 He was joined by Kim Gustley and Toril Simon, his handlers from Victory Gallop, for a meet and greet in Perkins Square Park. 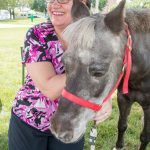 They had plenty of company as dozens of visitors stopped by his tent, donning cowboy hats, snapping pictures and stroking his fur. 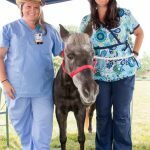 They may have even offered him a hard peppermint candy or two, his favorite treat. 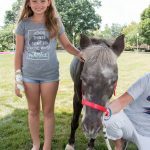 Now 26 years old, about 75 in human years, Petie is a miniature horse-Shetland pony mix and has no problem making weekly visits to the hospital when the weather is nice. 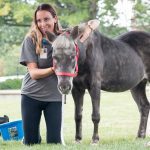 Click HERE to learn more about his adventures at Children’s, including a video highlighting a typical visit. 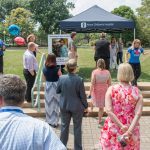 Photo credits: Jim Arnold, Digital Media Manager, Akron Children’s Hospital. 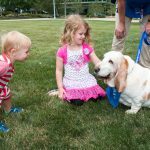 18-month-old Alexander Moon and his sister Adelyn, 4, were very excited to see Roxie and Karen Koslowski-Cahoon, one of our Doggie Brigade sponsored by Milk-Bone teams. 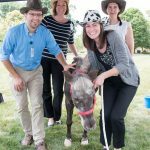 Nathan Klayko, Tia Buzzard, Emily Browning and Anna Caggiati from Patient Experience. 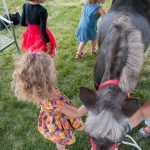 The Dickstein Family: 3-year-old twins Miriam (blue dress) and Ilana (flower dress) and 5-year-old Esther. 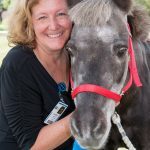 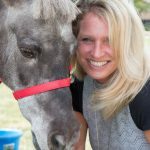 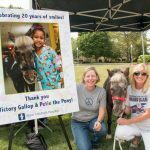 Kim Gustley from Victory Gallop has been coming to the hospital with Petie for all 20 years; Toril Simon, a volunteer with Victory Gallop has been coming for the last 7 years.